Updated: Aug. 31, 2:32 p.m.
Tim Walz and Jeff Johnson clashed Friday on the state budget, gun control measures and how to slow the rising cost of health care, outlining clear differences between the two candidates vying to be Minnesota's next governor. 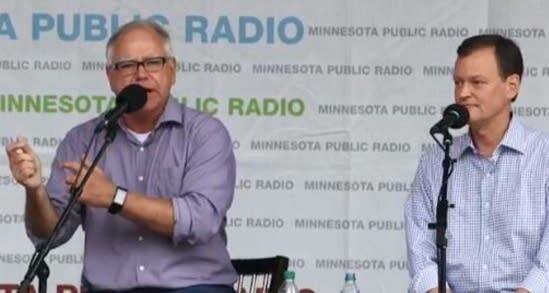 Walz, a Democratic congressman from Mankato, and Johnson, a Republican Hennepin County commissioner, debated for nearly an hour on MPR News in front of packed and vocal crowd at the Minnesota State Fair. The stakes are high for both parties. Republicans have complete control of the Legislature and could control all of state government if they win the governor's office this fall, but they haven't managed to win a statewide race in more than a decade. DFL Gov. Mark Dayton currently holds the governor's office, but he's leaving the seat open this fall, and it's been decades since a Democratic candidate for governor won following a Democratic administration. Just weeks after emerging victorious in contested primaries, the two candidates are now trying to create a clear choice for voters this fall. Here's how they tried to set themselves apart on the issues and how they would govern. Both candidates said they would prioritize spending on education, the state's largest budgeting area, but they repeatedly diverged on their philosophy on how to handle the rest of the state's $46 billion, two-year budget. Johnson said the state's budget has grown rapidly over the years and there's no single area he would commit to spend more money. Instead, he said he wanted to measure the effectiveness of state programs to see what's working and what's not. He would start looking to make cuts in areas like health and human services, but he didn't cite any specific programs. He criticized Walz, who he said has made more than 40 promises in various questionnaires to increase state spending, which he said translates to tax increases. "You're the greatest feel-good candidate we've ever seen. You're good at it," he said. "I think politicians should be honest about what they're going to actually do rather than make you feel good." Walz pushed back on that characterization, saying he looks at the state budget as a "moral document" rather than a series of numbers on a spreadsheet. "We can pay on the front end, or we can pay on the back end with things like incarceration," he said. He reiterated his support for more spending on health care as well as transportation, and said he's open to increasing the gas tax to do so. "Minnesotans are willing to pay their fair share, but they want it to be fair, and they want to make sure it's going somewhere," he said. Walz, a former state high school social studies teacher from Mankato, went directly after his opponent on the issue of Minnesota's large school achievement gap between white and minority students. He said students who don't have proper healthcare are not ready to learn. "Those health and human services budgets that Jeff are going to cut are going to exacerbate the gap here rather than close it," Walz said. Johnson said the solution to the problem is not spending more money. He said he would push to give teachers and students more flexibility to adopt programs and policies that work in their districts. "Let's empower parents and let's empower teachers," he said. Minnesota has had a 2 percent tax on medical providers since the 1990s to pay for MinnesotaCare, a healthcare program for low-income residents, but the tax is scheduled to end at the start of 2020. Walz said he would continue that the tax to pay for health and human services needs, but Johnson said he would end it, calling it a "$700 million tax increase" on health care. The debate over the provider tax opened a broader debate between the two candidates on their philosophies on how to keep health care affordable in the state. They both agreed that there were problems with the individual insurance marketplace as part of the Affordable Care Act, but Walz supports expanding MinnesotaCare and making it available to all Minnesotans in a public option. "You don't mind paying health care dollars to people who actually fix your health, what you don't like doing is paying to people who shuffle papers," he said. Johnson said that plan is a "terrible bargain" for people because average premiums would "go through the roof" under a single, public option and reimbursements rates would be cut to doctors and hospitals. "You would be driving rural hospitals and clinics right out of business," he said. The governor's race has quickly developed into a proxy fight over the president, who came closer than any Republican in decades to winning the state two years ago. Johnson has been an early backer of Trump and reiterated Friday his support for "the direction" he is taking the country, but he said he doesn't always agree with Trump's style. "I think most Minnesotans are adult enough to realize that I'm running for governor, I'm not the running mate of Donald Trump," Johnson said. Walz noted that he won as a Democrat in a Trump district, but he's been critical of the president in his campaign. He brought up the lack of an official statement from the White House after the death of Arizona GOP U.S. Sen. John McCain, who frequently clashed with Trump. "As governor of Minnesota, decency must rule," he said. Walz and Johnson also clashed on how make schools safer, with Johnson pushing for more funding to "harden" school security. He also said he supports arming trained professionals in schools. Johnson said things like family breakdowns, popular culture and school policies are leading more school shootings, and he pushed back on the notion that gun control measures are the answer to fixing the problem. "The answer is let's ban bump stocks, that will prevent the next school shooting, and it won't," he said. Walz said the conversation about school safety must include gun control, reiterating support for universal background checks and banning bump stocks. He said he would not support a proposal to arm teachers. "As a teacher, as a parent, arming teachers in the schools is not the right way to go." Johnson said he believes that climate change is real, but he wouldn't commit to spending any state resources to addressing the problem without evidence that "they are actually going to change anything." Walz said it's "flawed" to assume that spending on environmental policies are bad for the economy. "The path for a stronger economy is for Minnesota to own the clean energy economy," he said. "Being a state that leads on this." • What question do you want MPR News to investigate before you vote in the 2018 election?